View of the sunrise from our hotel room. This is our second time to Cancun’s Omni Hotel with this year’s purpose of just lying low and relaxing. We mostly stuck to the plan with the exception of a run to the grocery store, a morning dive trip, an all day tour of the Ek Balam Mayan archaeological site and a bus ride into town to check out the central market. On Monday, we took advantage of the weekly shuttle that the Omni runs to let guests stock up for the week. We probably bought a bit too much, but we do have a good selection of things to eat and snack on. Early, Tuesday morning, I walked over to the local dive shop (Aqua World) and went out on one of the dive boats for a wreck and then a reef dive. I hadn’t been on a wreck dive since the early 90’s, when we lived in Palau, when I had a chance to dive on an old WWII Japanese gun boat. 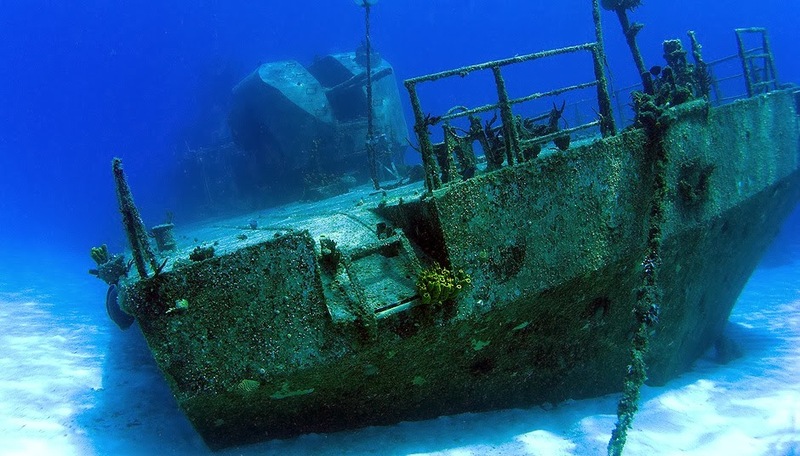 This wreck did not have the exciting history, as it was purposefully sunk at the very spot to create a man-made reef. None-the-less, it was fun to swim through the remains of the hull, which had split in two, each piece being separated by a couple of hundred meters. Not having my own underwater camera, I found a couple of photos of the wreck. With a relatively strong current, the reef dive was partly a drift dive. We coasted along the reef seeing lots of colorful, thriving, soft and hard coral. There was a good variety of fish, including an eagle ray, some barracuda, an inquisitive gray shark, several moray eels, puffers, angel and clown fish and several other “aquarium” varietals. Both dives were very enjoyable. On Wednesday, we took our only day-trip away from the hotel. We ventured out to visit Ek Balam, the latest Mayan archaeological site to be opened up to the public. Ek Balam is the oldest Mayan site in Mexico, dating back to the 3rd century and lies northwest of Cancun in the Yucatan peninsula. The main acropolis of Ek Balam (probably a tomb of one of the late kings). The primary altar of the acropolis made of stucco. Looking towards the acropolis from atop of one of the other structures. Our guide for the day, Victor, made sure we understood the Mayan numbering system. Unlike our decimal system, it is a base 20 system that only uses three symbols - it consists of a dot (for 1-4 values), a dash (for 5) and an almond-shaped symbol that represents zero. Victor went on to tell us that the Mayans were avid writers, who documented their culture, religion, history and much of their celestial observations. Unfortunately, most of the writings were burned by Conquistadors, who misinterpreted the books to be evil. Thus, only four volumes are believed to have survived, none existing in Central America. Yet with all their sophistication, the Mayans were not overly peaceful towards one another. They often warred with other Mayan cities. Also, they regularly practiced rituals of human sacrifice and cut themselves as a way to offer blood to the underworld gods. After our visit to Ek Balam, we headed north, to a bird sanctuary. Ria Lagartos lies right along the ocean and is a long peninsula running east-west covered with mangroves. We boarded two panga boats and set out to find the wildlife. We passed along a small coastal town and then ventured into a more remote area of the river quickly coming upon a small group of pink flamingos. We continued onward for about an hour and mostly saw birds we were all too familiar with such as pelicans (these were white), cormorants, plovers, herons and a few others. But this was a different habitat from what we were used to seeing them in. Just outside of Ria Lagartos, where we loaded into the boats. Pink flamingos looking for some lunch. We saw lots of white pelicans. A heron trying to blend in and look inconspicuous. The brown pelicans hung around the beach areas. Our last stop of the day was Valladolid, a Mayan city with very distinct Spanish architecture that lies an hour and a half west of Cancun. Valladolid was named after the city that once had been the capital of Spain. It was unfortunate that our only reason for our stop was to have dinner. We would have liked to stroll around, but as it was, we only had time for a brief stop at the central square and a quick peek at the town’s cathedral. The dinner was at La Casona, a large restaurant, offering authentic, local cuisine. The buffet had lots of choices of pork, beef and fish dishes with as much Corona one required to wash it all down. Dessert consisted of tapioca pudding, ice cream, cakes and fruits. Overall, a pretty tasty meal for being buffet style. We got back to our hotel at 8:30 p.m. It was a long day but worth the effort. The tour bus was very comfortable and served breakfast, lunch and beer. On Friday we took the bus into Cancun’s central market (Mercado #28). Walking past the numerous, narrow rows of stalls with its hawkers pleading us to stop and look, quickly wore us out. We realized that there wasn’t much of interest there for us. Besides, a cold cerveza awaited us at our room with a spectacular view of the white sandy beach. Saturday morning was spent eating breakfast, packing and a walk before heading to the airport. The news back home was of an extreme cold weather front. The 80 degree weather of Cancun was nice while it lasted. Our comfortable perch with a view - the balcony.